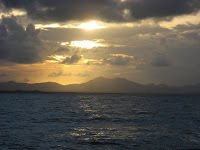 The area between the Dominican Republic and Puerto Rico is called the Mona Passage. It is a body of water getting squeezed between the two countries. All of a sudden the Caribbean Ocean narrows down into the Atlantic or visa versa. That’s a lot of turbulent water. 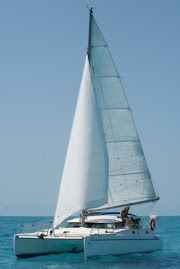 Add some current and many shallow areas that need avoidance and that influence the surrounding water and you get interesting seas, only to be battled in times of decent weather conditions: low swells (waves) and little wind (less then 15 knots). The day Irie left Punta Macao, our last stop in the Dominican Republic, the weather forecast was a little iffy. Once we were “out there”, the ocean and wind felt much better than the previous day. 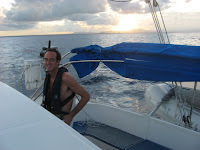 The water was still pretty choppy, but we decided to keep on going. Some people in Luperon had checked the weather online and this information got relayed to us by our friends Al and Gail from Chickadee. They were still in the anchorage and would leave around midnight. The wind came out of the North East, pretty rare and quite bothersome the first 9 hours, since we had to motor straight into it. After midnight, the hardest part was over. We heard later that Chicadee had to leave earlier because the anchorage in Punta Macao became dangerous in winds with a Northerly component. When Irie changed direction, the wind became our friend once again. It had been a long time! An almost full moon guided us through the passage and we managed to sail from here on, all the way past Isla Desechio, dodging a few rain clouds. 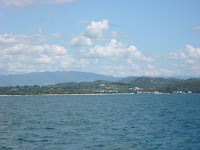 Once we passed this island, we decided to head for Boqueron. We read that you have to check into Puerto Rico in person, in the customs building of Mayaguez. This is a big and uncomfortable industrial harbour, where we didn’t want to stay or rest up. So we risked it and moved on, hoping we could check in by phone since we are both “Americans” and we had heard from others doing this and succeeding. We were sailing along and all of a sudden a police boat hovered over us. Mark had already talked to the Coast Guard who flew over us by plane before. The police were checking us out and following us. After a while, they made radio contact and we gave them all our information. For another 15 minutes, they followed us, close by. Then, they sped off, putting those four huge outboard engines to good use! About three hours later, when we came closer to shore, another police boat showed up. Same scenario, but this one didn’t like using the radio, so the conversation happened with screaming voices in Spanish, while we were alongside each other. Luckily, this was the extend of it. Al and Gail arrived at night and they had a police boat sneak up behind them, all of a sudden shining a huge beam of light into their cockpit. Over the next few days, we had several boats checking us out in different anchorages. Once, we woke up from a light entering Irie. We ignored their presence and never had any other conversations with them anymore. 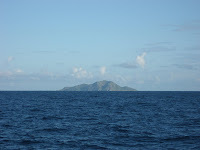 Around 1 pm, after 20 hours on the water, we arrived at our destination. The bay in Boqueron looked really nice. There were quite a few boats, but no other cruisers. 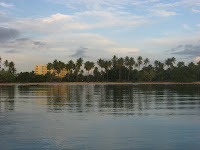 A huge beach lined with palm trees took up part of the shoreline. From the moment we were settled, Mark got off and called US Customs. No luck… We had to go to Mayaguez in person. Now. All we wanted to do was take a nap, but we knew about the risk involved. Our bad. First, we did “sneak” the dogs ashore, though, to let them go potty. Kali has been really good about peeing on the trampoline, but Darwin still refuses if he can hold it.